I'm firmly convinced that there are three ironing camps. The first is the camp of ironing devotees. They love to iron. They get great satisfaction in smoothing out all of the wrinkles in life and giving everything a distinctive crisp edge. The second camp, to which I belong, only irons for the special moments in life. We iron for important occasions like holidays, weddings, graduations. We iron to create something new like autumn leaves pressed between waxed paper, t-shirt decals or a web-fused hemline. The third, and final camp, doesn't own an iron and can't imagine the need for one beyond creating a grilled cheese sandwich in a dorm room or holding a door open. If you belong to camps one or two or wander out of camp three, there are a few basic things you need to know before you begin ironing. What type of ironing board do you have? Whether it is full-sized or a tabletop model, be careful about where you place it. Be sure that the cord of the iron is not strung across a walkway where a pet or child could pull the iron down. Check the iron to be sure the base plate is clean. Scorched build-up of starch or sizing can be transferred to clean fabrics.Take a look at your ironing board cover as well. It should be clean. Most covers can be washed or easily replaced. If you don't have an ironing board, you can still iron well by using a sturdy flat surface like a table or counter and preparing it correctly. Before you begin, read the garment or linen care label. There will be ironing guidelines written or shown with symbols. If the label is missing, refer to an ironing temperature setting chart for different fabrics. It is always best to start with the coolest temperature recommended for the fabric. You can always increase the heat but cooling an iron takes longer. If you have several things to iron, start with the fabric type that needs the coolest temperature setting and work up to the one that needs the hottest iron. This will save you time and prevent accidental melting or scorching. When ironing most fabrics, iron on the wrong side of the garment. This will prevent shining of the fabric. This is particularly important for dark colors, silk, rayon, linen fabric and acetates. For fabrics like velvet, corduroy and textured fabrics, ironing on the wrong side will prevent crushing and even removing the texture. I once had a friend iron a seersucker blouse on the right side and she removed all of the "puckering" that provides seersucker's texture. It is usually best to iron clothes while they are still slightly damp. The exception is when you need a completely dry iron on fabrics that water-stain. To add dampness, sprinkle the clothes lightly with water or use an ironing spray like starch or sizing to add moisture. When ironing shirt collars, cuffs, pockets or hems that are double thickness of fabric, iron on the inside first and then on the outside to smooth any final wrinkles. 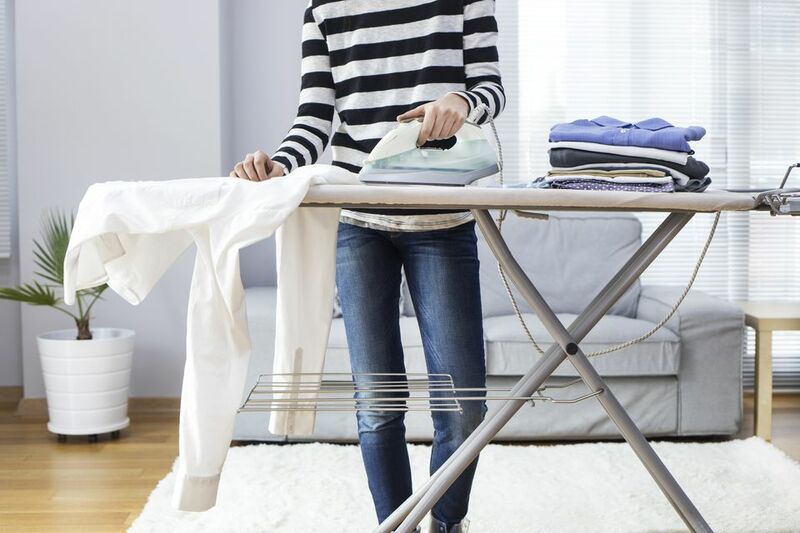 These areas will definitely benefit from steam during ironing or pre-wetting before ironing. Do not iron over zippers, buttons or any decorations. You should iron fabric lengthwise to prevent stretching. Clothes should be hung immediately after ironing to help them keep a just-pressed look. If you happen to scorch a garment, take steps to correct the situation immediately. If you don't enjoy ironing - or even if you do - there are ways to make the time more enjoyable and productive. Listen to music or set the ironing board up so you can watch television. It's a great time to listen to a book on tape. Enlist others to help you. Kids love to sprinkle water on clothes. I used to let my little boys use a water pistol to spray clothes. Ask others to take freshly ironed garments directly to the closet and hang them up.